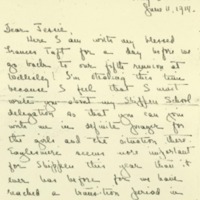 Alice Appenzeller writes to Jessie about academic life and shares news about herself and their mutual friends. Here I am with my blessed Frances Taft for a day before we go back to our fifth reunion at Wellesley! I'm stealing this time because I feel that I must write you about my Shippen School delegation so that you can join with me in definite prayer for the girls and the situation there. Eaglesmere seems more important for Shippen this year than it ever was before for we have reached a transition period in the history of Beta Sigma, and the next period will mean either decay or renewed vigor and activity. This year has been hard in many ways. The novelty of the organization had worn off, and the schedule is so full of all sorts of extra curriculum things besides heavy academic work that there seemed no time for ??. The girls who led the work were splendid, but the society was really almost crowded out of the school. Now Betty Lee and I are leaving, but we feel that it will be a good thing, if others will feel the responsibility of going on with the work. No one else on the faculty has seemed interested thus far, but we feel very much cheered to know that Miss Underhill, the principal, you remember, is to chaperone the delegation, because if she becomes thoroughly aroused to the importance of having a Christian Association in the school, she will not only make room for it in her plans, but helping in its work. I know that you will pray with us that this may be one of the fruits of the conference. We have never had so much difficulty in getting the girls to come to the conference before—It was a great surprise to me to find them so reluctant after the great enthusiasm of last year's delegation. But we've worked like mad and I hope that at least five girls will go. Rhoda Becker, next year's president, a dear girl, will go up on Monday, I think. I have such unlimited faith in you, in your power to draw those girls toward the shining ideal that you represent to them, that I'm giving them to you in these days, knowing that you will love them and help them to realize the joy and beauty of communion and service. I'm getting so homesick for Eaglesmere and for all that my two years there meant to me, that I can hardly bear to write any more—I hope the conference will be nicer than ever, and happier than ever for you—I love to think of those days with you a year ago, and of all that we talked of there. And then when I think of how God has led us in this year, and showed me so many things that were hidden from me then, I long to talk it all over with you and to hear of what this beautiful new year has brought you. I can guess a good deal, and knowing you, patch up an outline from the scraps of information that I get from various sources, chiefly the press. But it's starvation, when one is hungry for direct word from one's friend. It was a real joy to see you and your husband on your wedding day, and to be so satisfied in the sight. Helena Hogue Timann and I had such a good time going down and back together and becoming real friends in that little time. I'm so glad she's married now, too, and hope that he's really the right man for her. We've had a queer winter at home. Shall I tell you about it? First I just naturally collapsed, just before Christmas, and was in the house six weeks. Then Henry injured himself in basketball and had an operation in Brooklyn. At the very time we heard of that word came that College Hall at Wellesley had burned, and that Ida had lost all she owned in this world. But we've almost forgotten that loss in the deep thankfulness that no life was lost, and in the pride in the way those Wellesley people, every one of them behaved. Then Mary had a fortnight in bed with fever—so ended the ailments of the family, though I mustn't forget the dog, who was also seriously ill! Meanwhile I had received my appointment to Korea, so that I'm really going out in November to my dear old home, just as I have always planned to do. Mary has just graduated at Shippen and will be at home with Mother next year, and Ida graduates at Wellesley next week. Nothing but that commencement and my reunion could console me for missing Eaglesmere! Ida is to be Educational Secretary of the Woman's Foreign Missionary Society of our church next year, and will begin her work by going to three conferences this summer. Henry is back at his parish at Greenwich, Conn., and will finish at the seminary next year. I have many pleasant plans for the summer, and plan to rest and play around sometime in August, when I must go back home, do a lot of tutoring and make my preparations for Korea. After Wellesley I'm going to Maine, and then we're to have a brief family reunion at Berlin. I am looking forward to all of it, and very happy. It is so wonderful to know how things do work out. Betty Lee is going as far as Japan with me, as a teacher under our board. Isn't that fine! Frances is more wonderful than ever, prettier and dearer in every way. She is going back to China very soon, to be married August 6th. to the persistent lover I've told you of. She deserves rich happiness. Cecil Wilson has a little daughter now, and you know Brown married and went to China last fall. Marian Scranton has just been married to the man she used to be engaged to, an American! She will live very near to us in Seoul. Appenzeller, Alice R., “Alice R. Appenzeller to Jessie Woodrow Wilson Sayre,” 1914 June 11, WWP17484, Jessie Wilson Sayre Correspondence, Woodrow Wilson Presidential Library & Museum, Staunton, Virginia.